"The presentation, the flyover, the music.... It's one of the best that I've seen!" Each year on the last Saturday in May before Memorial Day, the Veterans Memorial Ceremony, held at the Veterans Monument, ..( Union Grove Cemetery), .. in Harshaw, WI, remembers and honors our veterans, their families, and our present day armed forces service men and women. Unlike most ceremonies, we extend our memoriam beyond speeches. Numerous presenters and hosts share one thought. "Respect and Remember". Our ceremony serves as both a tribute to our past and present armed forces veterans, and an education into the sacrifice our military has made , and continue to make , to protect america's freedoms. Please join us and pay tribute to all who gave some, and those "who gave all!" This year was recorded as the hottest ceremony to date. 95 degrees on May 26th, 2018. The duties of keeping the attendees hydrated were done by the Boy Scout troop 672 and the St Mark Lutheran Church LCMS. Medic 1 was on standby in case of any needed medical problems due to the high humidity and heat. No incidents were reported, which means they did a fantastic job! Preliminary music started @ 10:58 a.m., Cerermony began on time @ 11:30a.m. All regular participants were again there honoring our past veterans. Colors presented by the Tomahawk area Veterans Honor Guard. "Trillium" sang there beautifull songs, giving the audience a connection to the times. 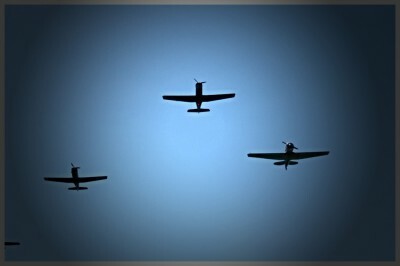 Tim Ashe did his precision Flyover and once again the Adventures in Spirit Creative Ministry performed "An Honor to Serve". Note: An audience member was aquainted with Jeremiah Denton, former POW , which is explained by former President Ronald Reagan (audio)-in the beginning of program. BG Joane Mathews - ANG gave an excellent heartfelt speech about our soldiers, and was appreciated by all. Her dedication was shining through with strong support. Joe Story of American Legion Post 93 of Tomahawk, gave a personal speech, a 27 year veteran, that was very emotional , and the attendees were taken back to his military years of service, with an up front and personal note. The word of the ceremony came with the start of the Pow / Mia Table ceremony. -"REPATRIATION" Due to the USMC Bravo Co, - Green Bay duties, Saturday they were assigned to an honorable job of the repatriation of Sgt. Elden W. Grimm. It was explained that al ceremonies were not just going through the motions about the MIA & POW's. There are many to date still unaccounted for which is the reason of having this ceremony. Sgt. Grimm was KIA in November 25 1943. on the small Island of Betio, he was 26 years old. The WI Army National Guard also had funeral duties the same day. So to pull the "Rolling Caisson" - the Boy Scouts pulled, BG Mark Michie (ret) & 7 Calvary Tony Seman lead, ecorted by Sgt. Dan Keck (ret). The rifle volley was then given to the Wi Veterans Light Artillery & Major John Pelhams Battery, followed by "Echo Taps" performed by Joey Blunk & Karol Domalik. And our Pastor Hans Juergen Heisinger again gave the blessings from the heart, and being well received. The folks at the Cassian Town Hall- We give thanks once again for the outstanding lunch that was served. Special thanks to our "Poppy Ladies" - Cheryl Kempen & Heidemarie Emmert and husband "Leo"
This years 17th annual service began for the set up crew friday @ 8:00 a.m. in the morning. The Ozaukee Guzzlers M/C , was once again at the cemetery working hard making all the preperations for this event to take place. Without them, it would take the entire day to make it ready for Saturdays memorial service. Light overcast at 4:30a m. (SAT), turned into a quiet clearing sky by 7:00 am. Preliminary music started at 10:58 a.m.
11:30 A.M. the ceremony began with Rick Smith giving the introduction. The Girl Scout Troop 7091 led the mornings "Pledge of Allegiance". Bagpiper Mike O'Connell brung in the "Colors" presented by the Tomahawk Area Veterans Honor Guard, escorted by Sgt. Stradford's unit "Bravo Co." USMC, with Joe Miller smudging. Highlights this year was guest speaker Chief warrant Officer 4 Tim Bahr, Noble Aviation Roger Shadick made his fly over at 11:40 on the dot. Cannons roared from the 8th Veterans Light Artillery of WI. ,and Major John Pelhams Battery ANV. 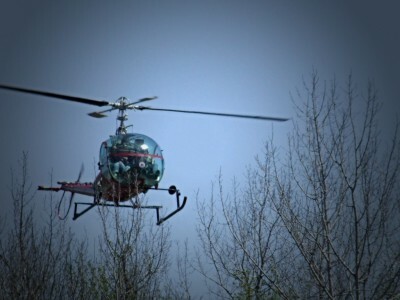 The veterans salute, with timely stopped positions was executed by "Sparky" of skyline helicopter service. 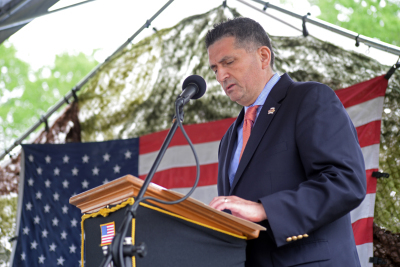 A special tribute was given by Rick Smith on behalf of the Veterans Ceremony-U.G.C.,Inc. 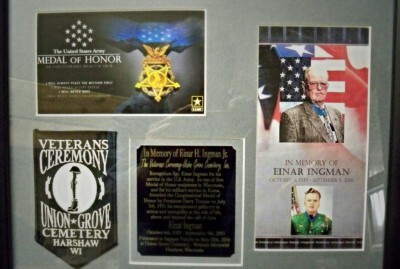 We remember one of our own..."Mike Wirth" who led the Einar Ingman Jr. veterans memorial motorcycle honor procession. Mike passed away May 12th, 2017, and was a very close friend. He was a Vietnam veteran 1965-1967 in the USMC. - A.K.A. "Sniper Mike"......... R.I.P. Bro. As "Roll Call" was being read, poppys were placed by Heidemarie Emmert and Cheryl Kempen, and a solemn procession began... escorted by our military branches was the "Rolling Caisson" slowing being pulled into place, to it's respective position by the Veterans Monument. The "Caisson" is a life's work of honor and respect that BT and Ginny Teska have been doing for over a decade. Returning "Adventures in Spirit -Creative Ministry" preformed "The Fallen- Not Forgotten", directed by Charlotte Wyles, and as always they were outstanding and the audience were highly receptive to the message being displayed. "Trillium" sang all the days songs with passion and ended the service bringing everyones spirits back to a place , to where people leave with a touch of closure in their hearts. As the last cannon fire and rifle volleys rang out, and Joe Blunk played "Taps"..... All payed respect as our "Colors" were once again retired for the service. A huge THANK YOU goes out to all the people behind the scenes that have given their time helping with this event!!!!!!!!!!! And a SPECIAL Thank You to the women at the Cassian Town Hall, for their hard work, and the delicious lunch that they served. continued up to 10:45a.m. The "Einar Ingman Veterans Memorial motorcycle Honor procession"
93 in Tomahawk WI. as the preliminary music was playing. leader Sgt. Frank Mueller. S/sgt. Erik Fritz, squad leader for the USMC Bravo Co., and U.S. 7th Calvary Tony Seaman joined, as Stephanie Schroeder played the cadence march on her bag pipes. Battery ANV's blast from their cannon. Pastor Hans Juergen Heisinger gave the mornings invocation with a calming but uplifting message. Then "Roll Call" by Maria Sabourin and retired Army Sgt. Craig lau, as Heidemarie Emmert and Cheryl Kempen placed the poppy's. John Pauke and Veterans of America M.C. placed the wreaths. 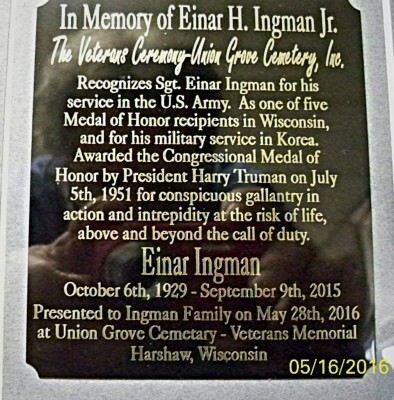 Secretary John Scocos of the WI Veterans of Affairs called in all Military Ranks and presented the Einar Ingman family a "Rememberance Plaque" on behalf of the Veterans Ceremony Board, honoring Sgt. Ingman as the last "Congressional Medal of Honor" recipient in Wisconsin of the Korean War. Sgt. Ingman received his award from President Harry Truman on July 5th, 1951. Einar once stated : "He wore the medal for men and country, and that he wore the medal not for himself, but for everyone who has served". by Gail Winnie. (Chairman of Veterans Monument Committee). After retired-BG Mark Michie finished his speech honoring Military individuals who lost their lives in the line of duty, another open window in the skies , and the "Veterans Chopper Salute" by "Sparky"
revitalized the crowd from there wet,... "soaked to the gills" state, as all joined in, as a sense of intensified respect came over the cemetery honoring our past veterans. "Don't Tell Me He is Missing", gave a true meaning to this important segment of the ceremony. Military units came to attention,and veterans Mike Wirth, Tim Sanders, Phill Gauthier and the Veterans of America M.C. also stood and recognized their missing and fallen comrades. this event are truly the most patriotic folks in this country. Our respect goes out to all of you!!!!!!! For all of the participants... The most heartfelt THANK YOU!! !, To all of our support team and the ones unmentioned behind the scenes, and to the ladies "Veterans Memorial Monument " volunteers at the Town Hall of Cassian...... serving all the folks.... THANK YOU!!!! If you've never experienced our event, please watch the highlight video by clicking on the image, and see what you are missing. We look forward to seeing you at the ceremony . Saturday, May 25th 2019 . Ceremony starts @ 11:30 A.M. Bring a chair for comfort, latrines on site, and free water will be available.